The expansion of services like Netflix and Hulu has led to fewer people subscribing to traditional cable. Still, there are some things you can't get with those streaming services, most notably live TV feeds. 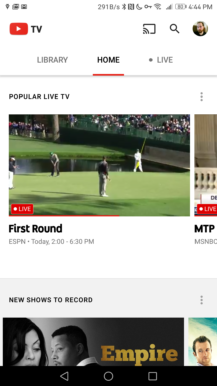 That's what Google aims to offer with YouTube TV. Google announced the service a few months ago, and it went live in a handful of cities yesterday. I haven't had a cable subscription in years, so I was anxious to try it out. 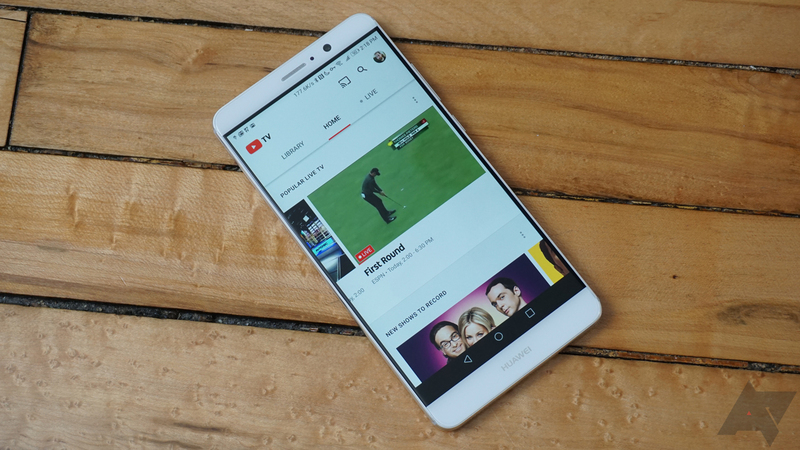 YouTube TV seems like an excellent start, but there are definitely some pain points. YouTube TV is currently only available in Chicago, Los Angeles, New York City, Philadelphia, and the San Francisco Bay Area. It will run you $35 per month and includes access to about 40 channels of live streaming TV. That includes local channels like Fox, CBS, and so on. The focus on live local channels is why the rollout is regional—Google has to get the broadcasters on board with YouTube TV in each market. There's a reasonably good selection of channels including all the locals, NatGeo, ESPN, Disney, FX, USA, SyFy, and more. There are no Viacom channels like Comedy Central or MTV, which is not unexpected. Viacom is notoriously protective of its content. There are also limited options for premium content—it's just Showtime ($11 per month) and Fox Soccer Plus ($15 per month?!). No HBO, which is a big boo. 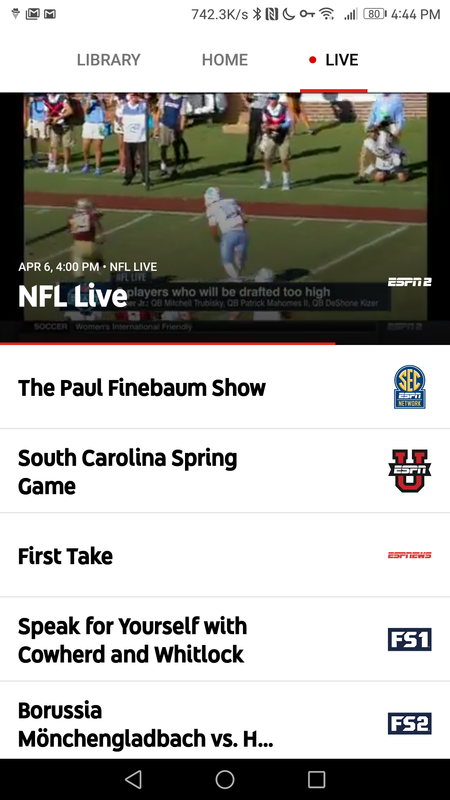 YouTube TV is available via the Android (or iOS) app, as well in your desktop web browser. There is not currently a client for Android TV, which strikes me as profoundly odd. There is, however, Chromecast support for getting the stream onto a bigger screen. Although, not everyone is cool with using their phone as a remote control all the time. You can watch live streams of all the included channels, and there's some on-demand content too. If you can't catch something live, you can set up series recordings in YouTube TV. All the content you record is saved online, and you can record as much as you want. How can it be unlimited? The recordings expire after nine months. Still, PlayStation Vue removes things after 28 days, and Sling TV limits you to 50GB of space. 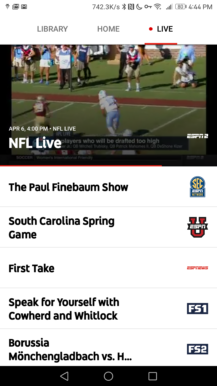 I've mostly been using YouTube TV on Android, and the app is nice overall. The interface is clean, with just three tabs in the main interface and heavy use of animated thumbnails. Across the top of the app are tabs for Library, Home, and Live. The Home tab is basically a list of suggestions for things you might want to watch or record—it even shows you what's most popular right now. 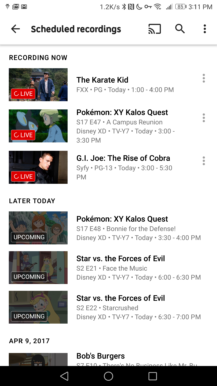 The "popular" live carousel at the top is the first place you'll see YouTube TV's live thumbnails. The channel previews play (no sound, thankfully) as you scroll through. It's like flipping channels on your TV. Below that are several lists of suggestions, including a few that push sports. Over in the Live tab, it's again like flipping channels. You scroll vertically through the channel list, and each one has a live thumbnail when it's selected. Sound doesn't kick in until you tap on a channel to watch it. I'm impressed with how smooth this interface runs with all the live thumbnails. The streams were noticeably jerky on the LG G6, but everything runs fine on the Mate 9 and Pixel. I'm not sure what's up with the inconsistency there, but it's usually a very snappy app. The streams are 720p for most channels, so they don't look flawless when casting to a TV (some are 1080p). No one I've showed it to thought the video (720p or 1080p) looked bad, though. 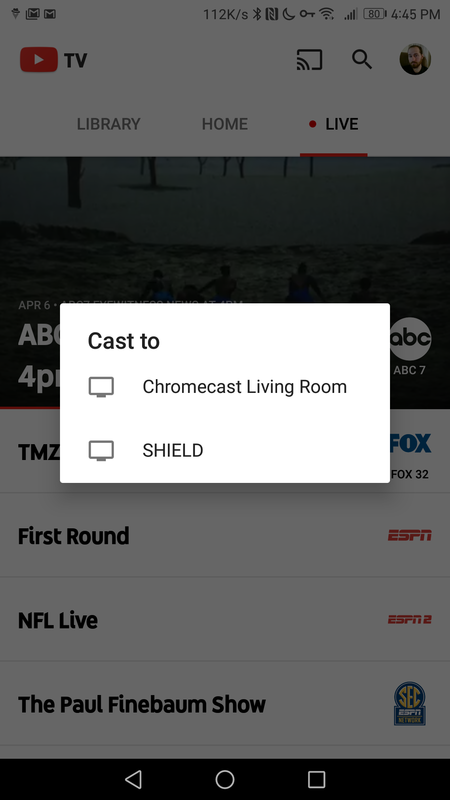 Video quality is great on the device and good enough when casting to a Shield TV or a second gen Chromecast. I don't have a first gen dongle around to test anymore, but apparently the app warns you of possible performance issues there. Audio playback will continue in the background while you do other things in the app, but it stops when you leave it (the regular YouTube app has background play for Red subscribers). That's probably not a huge deal for TV, but it would still be nice to have. A floating pop-out player would be better, though. 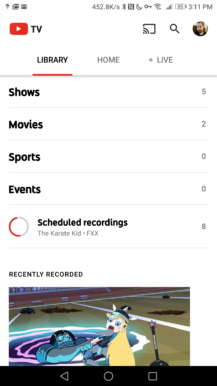 Throughout the app you'll see the "plus" button to add a series or movie to your library. Doing so will record any new instances of the content whenever it airs on TV. You can simply add anything that looks interesting to your library because the storage is unlimited. Recordings can be started after a program begins, but it won't actually be available in your library until it's over. Recordings that you've scheduled ahead of time will let you scrub back to the beginning if you want to watch live, which is a great feature to have. And yes, you can skip commercials in recorded content. The Library tab is split up into shows, movies, sports, and events. There's also a section that shows all your scheduled recordings, including those that are in progress. 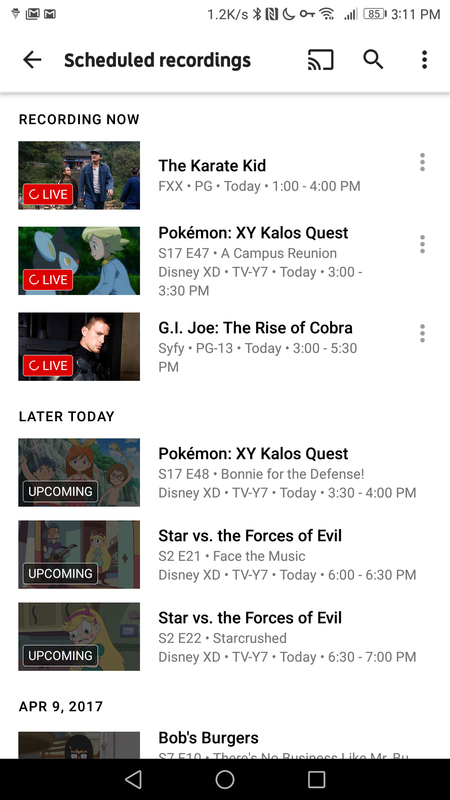 There's some on-demand content available in YouTube TV, which is confusingly merged with your recordings. 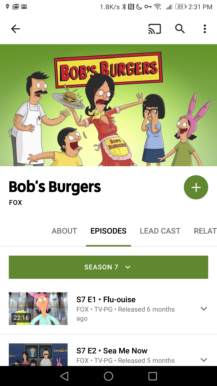 The app doesn't really differentiate between the two when you are subscribed to a show—you just have a details page with a list of all available episodes. In addition, there are still restrictions on how many on-demand episodes are available from one rights holder to the next. You can end up with a patchwork of available streams. I should also note that some of the on-demand content has ads; mostly movies with pre-roll ads. The desktop interface is slick too. YouTube TV is only in a few markets right now, and that limits what you can do even if you live in one of those places. Let's say you live in Chicago. 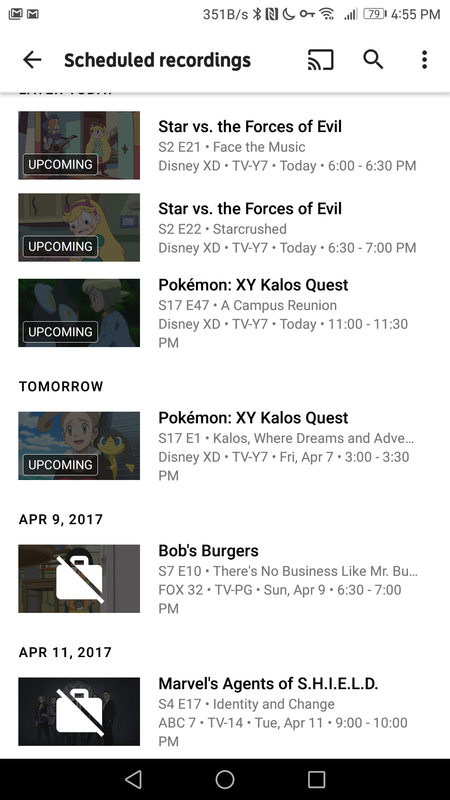 YouTube TV streams you all your local channels, lets you set recordings, and watch them at any time. 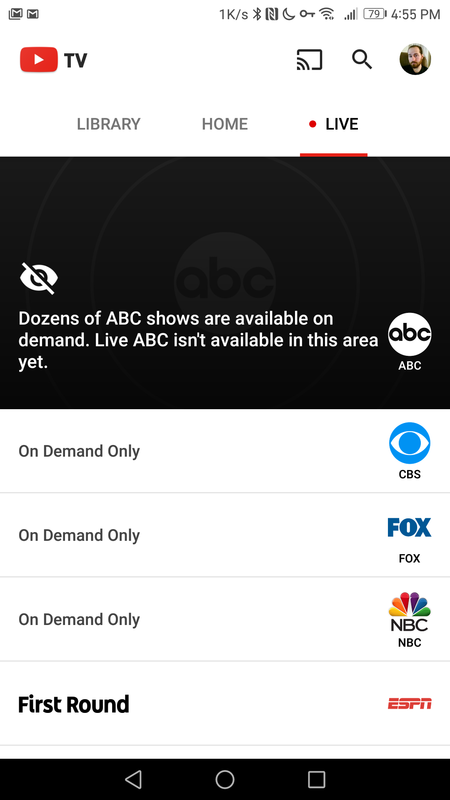 If you go on a trip to Orlando where there's no YouTube TV, you can no longer access those local channels live or create new recordings. Content you've recorded is still accessible in the Library tab, and the cable channels are live. Weirder still, there are completely different restrictions if you travel to New York where there is YouTube TV. You can't see your Chicago stations live, but you can see the New York ones. However, you can't create new recordings on the local channels while in New York. The cable channel recordings work normally in this situation. There will be some other bizarre restrictions too; like no football games streamed on the phone. You have to cast them to a TV because Verizon has an exclusive with the NFL on mobile streaming. This whole situation only serves to remind us what a mess TV streaming rights have become. 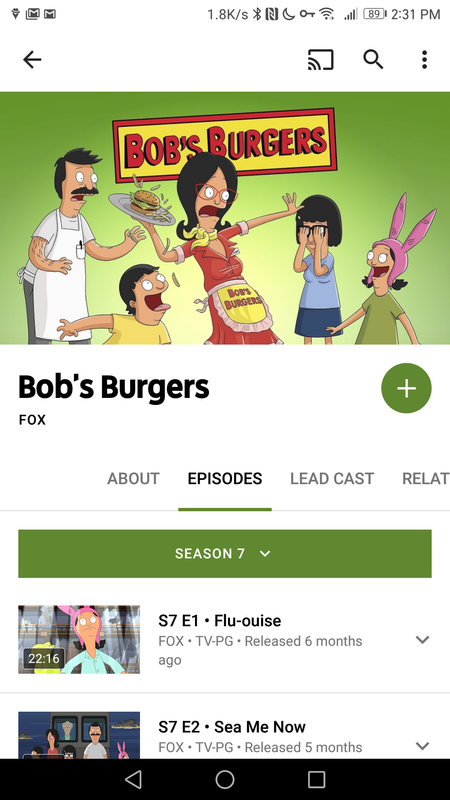 YouTube TV supports up to 6 accounts per subscription. They're tied to Google's family group system. You cannot set these up from the Android app, which is strange. 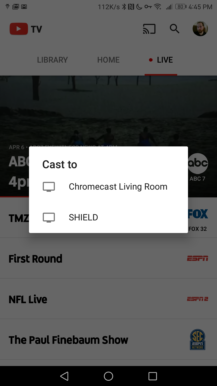 YouTube TV invitations can only be sent from the web. That said, it works just fine once you get people added. Each user has their own settings and library of recordings. However, there's a maximum limit of three active streams per account. The value proposition here will depend on what you want out of TV. If you won't put up with missing a show here and there, YouTube TV probably won't work. The selection is better than other streaming-only services thanks to all the local channels, but you're still missing big ones like Comedy Central, MTV, HGTV, and TNT. For sports fans who have wanted to drop cable, this might finally be what lets you cut the cord. You ought to be able to see most everything with local channels, a few ESPNs, and other sports channels. If you haven't had cable for a while and Netflix is starting to get stale, YouTube TV could be just what you need. It gives you something to stream live, along with faster access to new episodes of your favorite shows. 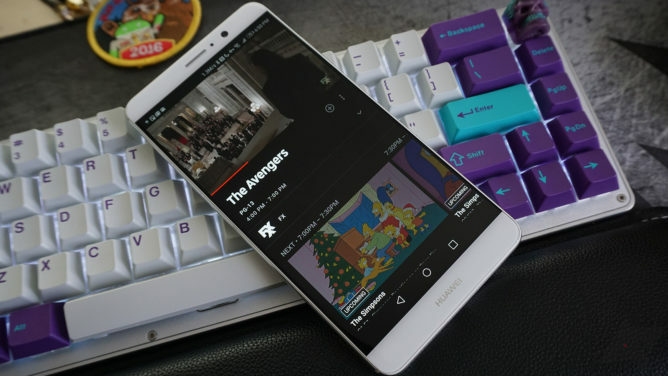 The $35 monthly cost is a bit steep for a single person, but if you've got a few family members who would use it, YouTube TV can be a very good value. I'm undecided if I'll keep YouTube TV past the one-month free trial. I already have Netflix and Hulu, and I don't watch sports. So, the added expense feels a little high. I expect Google will work to expand the channel list quickly, and YouTube TV might be an easy sell after a few additions.